I wanted to do a little series to introduce everyone to my household and my cats. They are not perfect and have had their share of behavioral issues that we have worked through. I enjoy my clients and readers knowing that I have personal experience in my own home with many of the issues that I help solve on a daily basis- and I also just love talking about my girls too! Hope you enjoy learning a little bit more about me and my cats! Fiona is the second cat that I have owned as an adult. Growing up my family fostered cats and kittens and we had about 100 come through our household. The first cat I owned myself was my hospice kitty, G.C., who had a great deal of health issues and was in her final days when I opened my home to her. She was living at the vet clinic I worked at and I wanted to let her have a real home for the last few weeks (which really turned into almost a year!) of her life. After G.C. passed I was getting ready to move so I knew I didn’t need to bring a new animal into my life at this point as it would be very stressful for everyone. A few weeks after I was settled into my new home and a new job I received a call from the vet clinic I had worked at and they let me know they had a new cat at the clinic that was an owner surrender. 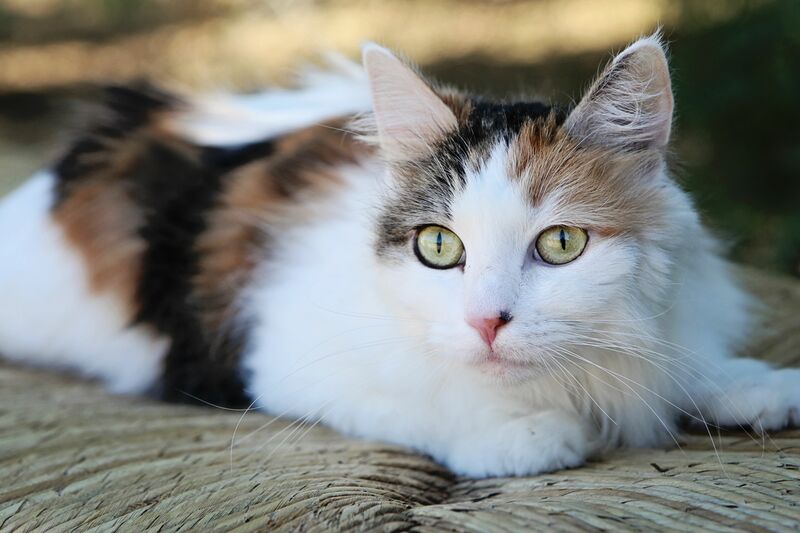 Kaley, as she was named at the time, was a beautiful 7-year-old calico cat who had a habit of chewing on wires and cords. She also had a grade 4/5 heart murmur and was not able to keep weight on her. She was not able to roam the vet clinic like G.C. had because of her cord chewing habit. I went and met her and of course fell in love, because how could you not! I promptly renamed her Fiona because it was just a better fit I felt-and yes, she does respond to the name Fiona now and it did not take very long to teach her a new name. I took her home and she was a little skeptical at first and slinked around exploring her new house. After a few days, she settled in and just wanted to sleep in bed with me, sit on the couch, and share any snacks I was having. I found out her favorite scratchers were corrugated cardboard and she loved sitting on the top of the 6-foot cat tower or looking out the window. She has never been the most social cat with new people, but she warms up to people who are calm and let her approach them. I did find out the hard way that, yes, she really is cord chewer! Over the years she has ruined a few phone chargers, my Surface Pro 2 charger, and even a lamp cord-very much a hazard! I will talk more in-depth about wire chewing in a few weeks. I also found out that she is unable to have plastic bowls or toys as she does get “cat acne” from the plastic contact on her face. Being a long-haired cat, Fiona is prone to hairballs so we have added in a daily hairball supplement which helps to reduce her leaving me those lovely presents around that house. She does have a grade 4/5 heart murmur as well. The only symptom of this is the fact that she is not able to keep weight on well and has gradually been losing weight as she is getting older, but we have found a way to manage that with high calorie food and a probiotic supplement. Fortunately, other than that she is very healthy! Fiona has now been with me for 5 years and has been through multi moves and driven with me back and forth to New Mexico multiple times. She has also been given a kitty sister, Bianca, and a dog sister, Rosemary. Rosemary now lives with my parents with their other dog, Gypsy Jean. Fiona is a very loyal cat and totally trusts me as her owner. With her medical and behavioral issues I try to be cautious of stressing her too much, but I know that I have made my share of mistakes over the years, don’t worry I will tell you all about those coming up. I have learned a ton from her over the years and I am happy that I get to share those experiences and learning opportunities with you! Today, at 12 years old, she lives with me in the condo that she first started out with me in with her kitty sister, Bianca. 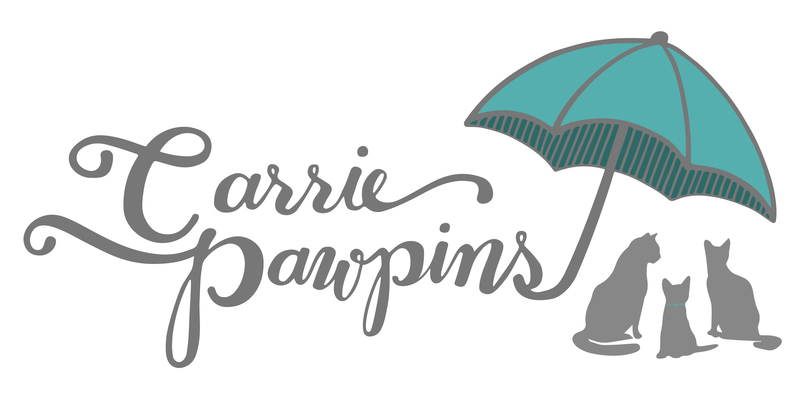 Contact Carrie for all of your feline behavior modification needs! Carrie Pawpins has gone to the cats!